The Hellenistic period or "Greek like" of Greek history was the period between the death of Alexander the Great in 323 BC and the annexation of the Greek peninsula and islands by Rome in 146 BC. Although the establishment of Roman rule did not break the continuity of Hellenistic society and culture, which remained essentially unchanged until the advent of Christianity, it did mark the end of Greek political independence. During the Hellenistic period the importance of "Greece proper" (that is, the territory of modern Greece) within the Greek-speaking world declined sharply. The great centers of Hellenistic culture were Alexandria and Antioch, capitals of Ptolemaic Egypt and Seleucid Syria respectively. See Hellenistic civilization for the history of Greek culture outside of Greece in this period. 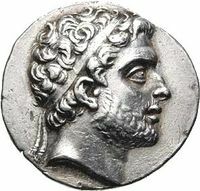 Silver coin depicting Demetrius I founder of the Indo-Greek kingdom. The conquests of Alexander had a number of consequences for the Greek city-states. It greatly widened the horizons of the Greeks, making the endless conflicts between the cities which had marked the 5th and 4th centuries BC seem petty and unimportant. It led to a steady emigration, particularly of the young and ambitious, to the new Greek empires in the east. Many Greeks migrated to Alexandria, Antioch and the many other new Hellenistic cities founded in Alexander's wake, as far away as what are now Afghanistan and Pakistan, where the Greco-Bactrian Kingdom and the Indo-Greek Kingdom survived until the end of the 1st century BC. The defeat of the Greek cities by Philip and Alexander also taught the Greeks that their city-states could never again be powers in their own right, and that the hegemony of Macedon and its successor states could not be challenged unless the city states united, or at least federated. The Greeks valued their local independence too much to consider actual unification, but they made several attempts to form federations through which they could hope to reassert their independence. Following Alexander's death a struggle for power broke out among his generals, which resulted in the break-up of his empire and the establishment of a number of new kingdoms. Macedon fell to Cassander, son of Alexander's leading general Antipater, who after several years of warfare made himself master of most of Greece. He founded a new Macedonian capital at Thessaloniki and was generally a constructive ruler. Cassander's power was challenged by Antigonus, ruler of Anatolia, who promised the Greek cities that he would restore their freedom if they supported him. This led to successful revolts against Cassander's local rulers. In 307 BC Antigonus's son Demetrius captured Athens and restored its democratic system, which had been suppressed by Alexander. But in 301 BC a coalition of Cassander and the other Hellenistic kings defeated Antigonus at the Battle of Ipsus, ending his challenge. After Cassander's death in 298 BC, however, Demetrius seized the Macedonian throne and gained control of most of Greece. He was defeated by a second coalition of Greek rulers in 285 BC, and mastery of Greece passed to Lysimachus, king of Thrace. Lysimachus was in turn defeated and killed in 280 BC. The Macedonian throne then passed to Demetrius's son Antigonus II, who also defeated an invasion of the Greek lands by the Gauls, who at this time were living in the Balkans. The battle against the Gauls united the Antigonids of Macedon and the Seleucids of Antioch, an alliance which was also directed against the wealthiest Hellenistic power, the Ptolemies of Egypt. Antigonus II ruled until his death in 239 BC, and his family retained the Macedonian throne until it was abolished by the Romans in 146 BC. Their control over the Greek city states was intermittent, however, since other rulers, particularly the Ptolemies, subsidised anti-Macedonian parties in Greece to undermine the Antigonids' power. Antigonus placed a garrison at Corinth, the strategic centre of Greece, but Athens, Rhodes, Pergamum and other Greek states retained substantial independence, and formed the Aetolian League as a means of defending it. Sparta also remained independent, but generally refused to join any league. Antigonus II died in 239 BC. His death saw another revolt of the city-states of the Achaean League, whose dominant figure was Aratus of Sicyon. 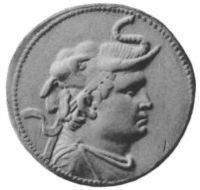 Antigonus's son Demetrius II died in 229 BC, leaving a child ( Philip V) as king, with the general Antigonus Doson as regent. The Achaeans, while nominally subject to Ptolemy, were in effect independent, and controlled most of southern Greece. Athens remained aloof from this conflict by common consent. Philip V, who came to power when Doson died in 221 BC, was the last Greek ruler with both the talent and the opportunity to unite Greece and preserve its independence against the "cloud rising in the west": the ever-increasing power of Rome. He was known as "the darling of Hellas". Under his auspices the Peace of Naupactus ( 217 BC) brought conflict between Macedon and the Greek leagues to an end, and at this time he controlled all of Greece except Athens, Rhodes and Pergamum. In 192 BC war broke out between Rome and the Seleucid ruler Antiochus III. Some Greek cities now saw Antiochus as their saviour from Roman rule, but Macedon threw its lot in with Rome, and Antiochus was defeated at Thermopylae in 191 BC. During the course of this war Roman troops crossed into Asia for the first time, where they defeated Antiochus again at Magnesia on the Sipylum ( 190 BC). Greece now lay across Rome's line of communications with the east, and Roman troops became a permanent presence. The Peace of Apamaea ( 188 BC) left Rome in a dominant position throughout Greece. During the following years Rome was drawn deeper into Greek politics, since the defeated party in any dispute appealed to Rome for help. Macedon was still independent, though nominally a Roman ally. When Philip V died in 179 BC he was succeeded by his son Perseus, who like all the Macedonian kings dreamed of uniting the Greeks under Macedonian rule. Macedon was now too weak to achieve this objective, but Rome's ally Eumenes II of Pergamum persuaded Rome that Perseus was a threat to Rome's position. As a result of Eumenes's intrigues Rome declared war on Macedon in 171 BC, bringing 100,000 troops into Greece. Macedon was no match for this army, and Perseus was unable to rally the other Greek states to his aid. Poor generalship by the Romans enabled him to hold out for three years, but in 168 BC the Romans sent Lucius Aemilius Paullus to Greece, and at Pydna the Macedonians were crushingly defeated. Perseus was captured and taken to Rome, the Macedonian kingdom was broken up into four smaller states, and all the Greek cities who aided her, even rhetorically, were punished. Even Rome's allies Rhodes and Pergamum effectively lost their independence. Under the leadership of an adventurer called Andriscus, Macedon rebelled against Roman rule in 149 BC: as a result it was directly annexed the following year and became a Roman province, the first of the Greek states to suffer this fate. Rome now demanded that the Achaean League, the last stronghold of Greek independence, be dissolved. The Achaeans refused and, feeling that they might as well die fighting, declared war on Rome. Most of the Greek cities rallied to the Achaeans' side, even slaves were freed to fight for Greek independence. The Roman consul Lucius Mummius advanced from Macedonia and defeated the Greeks at Corinth, which was razed to the ground. In 146 BC the Greek peninsula, though not the islands, became a Roman protectorate. Roman taxes were imposed, except in Athens and Sparta, and all the cities had to accept rule by Rome's local allies. In 133 BC the last king of Pergamum died and left his kingdom to Rome: this brought most of the Aegean peninsula under direct Roman rule as part of the province of Asia. Hellenistic soldiers of the Egyptian Ptolemaic kingdom, 100 BCE, detail of the Nile mosaic of Palestrina. The final downfall of Greece came in 88 BC, when King Mithridates of Pontus rebelled against Rome, and massacred up to 100,000 Romans and Roman allies across Asia Minor. Although Mithridates was not Greek, many Greek cities, including Athens, overthrew their Roman puppet rulers and joined him. When he was driven out of Greece by the Roman general Lucius Cornelius Sulla, Roman vengeance fell upon Greece again, and the Greek cities never recovered. Mithridates was finally defeated by Gnaeus Pompeius Magnus (Pompey the Great) in 65 BC. Further ruin was brought to Greece by the Roman civil wars, which were partly fought in Greece. Finally, in 27 BC, Augustus directly annexed Greece to the new Roman Empire as the province of Achaea. The struggles with Rome had left Greece depopulated and demoralised. Nevertheless, Roman rule at least brought an end to warfare, and cities such as Athens, Corinth, Thessaloniki and Patras soon recovered their prosperity.